Whether on CRT monitors, HDTVs, or the Game Boy’s monochromatic display, Tetris has long been a reliable source of entertainment (and jaw-clenching stress) for puzzle-seeking players. 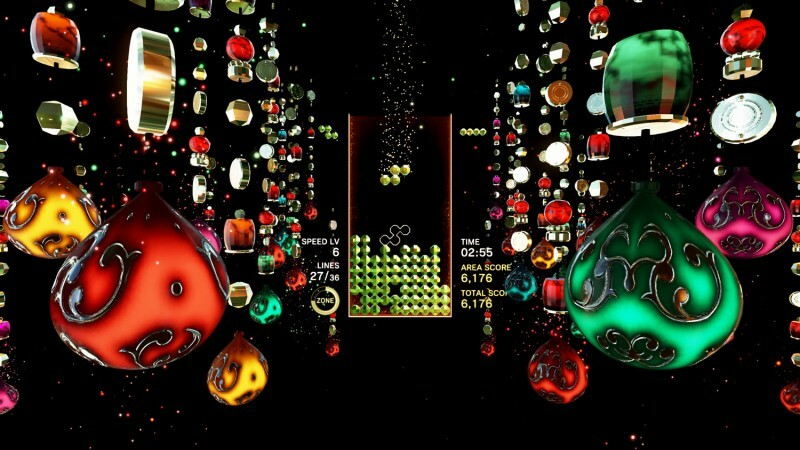 Its elegant simplicity has made it an enduring success, but with Tetris Effect, Monstars Inc. and Resonair shows that it’s possible to wring a few surprises from the classic game while respecting its primordial core. Tapping into their mastery of melding flashy audiovisual presentations with interlinked gameplay, the team has created a breathtaking interpretation of Tetris that makes the game feel fresh. A variety of other options offer further twists on Tetris’ core. In Sprint, you try to clear 40 lines as quickly as possible. Marathon mode challenges you to eliminate 150 lines, which is easier said than done. In Purify, you have to clear dark blocks from the field by clearing lines around them. Mystery mode is one of my favorites even though it made me want to punch walls; random effects like bombs, reversed controls, and other nuisances crop up as you play a marathon session. Even though you’re ultimately just clearing lines in all of these modes, they’re a fun and rewarding way to mix things up when you hit a wall. While I’d argue it would largely be missing the point, you can turn down the visual effects and music and just play a great game of Tetris, too, with a variety of customization options such as how many blocks appear in the preview panes and how rotation works once a tetronimo lands. The fundamentals may be recognizable, but Tetris Effect feels like something new rather than another reskin of the same old game. The presentation is such a natural fit for the gameplay, and it adds an unexpected layer of emotion. Monstars Inc. and Resonair should be commended for taking a calculated risk and delivering its own unique take on a gaming standard.